Observation - Sparrowhawk kill - UK and Ireland. Description: Saw a female Sparrowhawk take out this Homing Pigeon on Friday. A car scared the hawk off and it did not return to the kill. The pigeon had rings on both legs - '1707733/NL 2007' and 'NPO B05008'. By the morning the carcass had vanished. Saw a female Sparrowhawk take out this Homing Pigeon on Friday. A car scared the hawk off and it did not return to the kill. 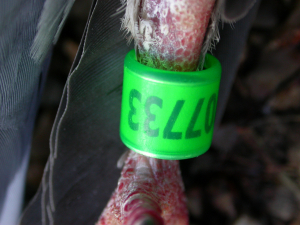 The pigeon had rings on both legs - '1707733/NL 2007' and 'NPO B05008'. By the morning the carcass had vanished.